Urban setting, even though at moments convenient, is not the ideal breeding ground for creativity. Because of this, once you feel like stuck in your work and without making any progress, it might be best idea to go on a brief vacation, and try to overcome this blockade by surrounding yourself with nature. Unfortunately, making a pause in your project is not always acceptable solution so, more often than not, you will be forced to take your work along. Now, in order to make all of this more efficient, you would be wise to make an office in your cabin as well. Here are some ideas. The best thing about making an office in your cabin is the fact that number of distractions here will be reduced to minimum. First of all, you will get rid of all the noise present in urban setting. In your house, you would have to allocate a room next to the yard or one in the most quiet room of the home, while here you won’t have such a dilemma. Furthermore, here you will be far from all those mundane problems you are facing in your comfort zone, which means that you will be able to completely focus on task at hand. Naturally, you won’t need to equip your cabin office with everything that you home office has, but some things are a most definite must-have. For example, some people think that working from home or cabin, means that you can just sit on the sofa in pajamas with a laptop and work. Now, while this perhaps seems plausible in theory, in practice this idea is not so great. In order to get maximal productiveness, at least part of you must believe that you are in a way still in office. 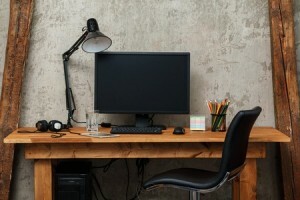 The easiest way for you to achieve this is by bringing your work computer along and by installing an adequate office workstation in your cabin. It is a known fact that people tend to perform worse in messy surroundings which means that it will be a paramount to keep your cabin clean and neatly organized. In fact, why not subject the entire decoration of your cabin in order to make it into a perfect work environment by making it appear cozy and inviting. Go for soft rather than angular, and in the choice of colors always go for warmer ones. Finally, since after all you are in nature, adding some fresh flowers in a vase to the mix is yet another plus. It is a known fact, that positive surrounding can make us more productive and with this in mind, working in your cabin might be a great thing indeed. Just make sure to remember that you are still on vacation so get your daily dosage of fresh air while at it. When faced with a deadline, some people will believe that this is no more than a waste of time but this kind of exhaust vent will allow you to focus more on your work later on. Once a creative blockade strikes, you will catch yourself staring aimlessly at the monitor. Walking it off a bit might help get you back on track and what better way is there to do so than to take a short stroll through the woods or next to a lake? As you can see, with just a bit of will and perseverance you can easily add a cozy home office to your cabin. Even though some might perceive this as a lot of effort, it will be an effort well spent when the end results are taken into consideration. Finally, the productivity boost that you will get in this way, will most definitely be more than worth your while.